We are pretty excited about our latest work and can’t wait to share it with the world….coming soon still seams like a bit of time…we know! Available for preorder (Oh do we love preorders!) at your local independent bookstore, or IndieBound, Amazon, Powell’s, Barnes & Noble and Books-a-Million. 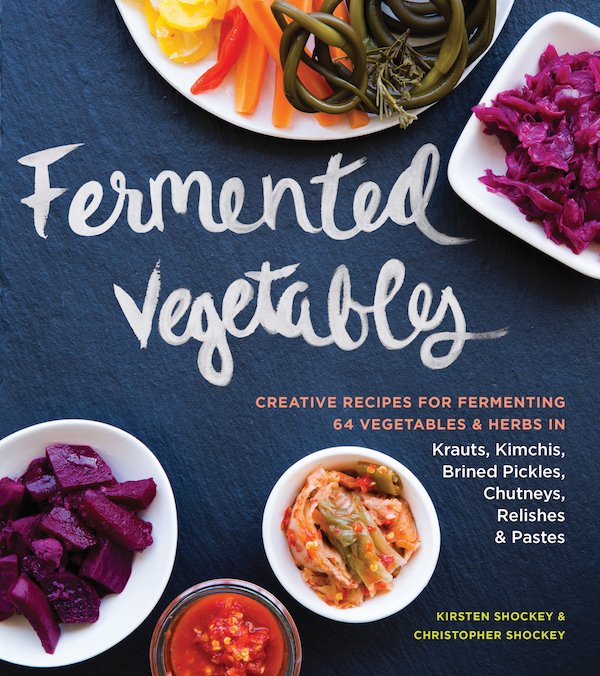 "What an exciting new resource for fermentation enthusiasts! Kirsten and Christopher Shockey explain in clear step-by-step detail classic methods from different parts of Asia for fermenting legumes and grains, as well an innovative new applications. The ferments in this book include some of the most complex, technically demanding, and potentially intimidating, but Kirsten and Christopher demystify them and make them readily accessible for home and restaurant kitchens. This book opens the door to amazing culinary adventures and incomparable umami flavors." “…The Shockeys have put together a thorough and masterful work that builds on that same theme — that education and knowledge are essential. Though our daily lives are very different, in many ways, we work in parallel track. But if there’s one thing I know about fermenters and their world, it’s that they only ever want it to grow. They seek to share their microbial cultures, the bits and bobs, the know-how; and in doing so, they hope to enlarge the community of it all. While cooking might bring people together, fermentation weaves those people into a common tapestry. All life comes from life, all cells from cells, and all culture from culture. As the authors will explain, fermentation has persisted for so long because it has helped civilizations the world over to sustain themselves and thrive. "Food is life, but as Kirsten and Christopher Shockey demonstrate in this marvelous book, it is also alive. That is, food ferments. It bubbles and churns, froths and foams, releasing compounds that benefit our health. But Fiery Ferments isn’t primarily about nutrition (though that’s a nice bonus). The Shockeys celebrate flavor, specifically flavor that zings, and they are excellent guides into the lively world of fermentation—the wonders of microbial action, the magical transformations it achieves. And what magic! Fiery Ferments travels the globe as the recipes progress from familiar hot sauces and salsas to condiments other cultures enjoy: Haitian pikliz, Indian achar, Indonesian rempah, Yemeni zhug. And they’re all presented in a spirit of experimentation and fun. Why stick to traditional kimchi made with cabbage when you can use nettles, green beans, summer squash, or rhubarb instead?" -Alex Lewin, Author of Real Food Fermentation and Kombucha, Kefir, and Beyond. "For anyone interested in delving deeper into the fermentation of vegetables, this book is a valuable resource, one of the most impressive new additions to the growing literature of fermentation. Fermented Vegetables offers a thorough review of basic concepts, tools, ingredients, and processes, and a great recipe section, organized by vegetable, perfect for gardeners or anyone looking for creative ideas for using and preserving seasonal abundance." "Fermented Vegetables is nothing if not thorough, which is exactly what I was hoping to find in this handsome, detailed, in-depth book. Such good information and so much of it!" "Kirsten Shockey and Christopher Shockey take the art of lacto-fermentation to a whole new level in Fermented Vegetables. The authors provide precise instruction for beginners and then inspire the reader with wonderfully creative ways to use sauerkraut and all its cousins in everything from quiche to enchiladas. This beautifully illustrated book belongs on the shelves of both amateur and professional chefs." "How to do it and what to do with it! This book covers all the aspects of fermentation. Eggplant, kimchees, fermented Basil, sweet to savory. All you need to know lies in this book. Le pigeon now has a new "how to" to grace our book shelves." 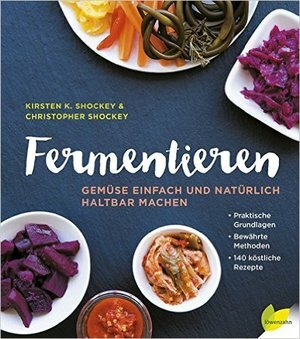 Kirsten K. Shockey and Christopher Shockey are the coauthors of Fiery Ferments, best-selling Fermented Vegetables and forthcoming Miso, Tempeh, Natto and other Tasty Ferments: A step-by-step guide to fermenting grains and beans for Umami and Health. They got their start in fermenting foods twenty years ago on their 40-acre hillside smallholding which grew into their organic food company. When they realized their passion was for the process, they chose to focus on teaching fermentation arts to others. They teach worldwide and host workshops on their homestead in southern Oregon. Their days are a chaotic combination of parenting, day jobs, writing and navigating whatever the climate and the rural lifestyle throws their way. Every day is different. Christopher and Kirsten can be found watering, preserving harvests, making cheese, planting trees, chopping firewood, mucking stalls, hiking, dreaming up the next project, reading, or dancing on the porch under the stars. At the end of the day they go to bed exhausted and knowing life is good. We are constantly trying to support folks who want to ferment their vegetables and we are continually adjust this space in order to help each of you make and enjoy amazing fermented vegetables. We have added a Free Fermentation E-Course for that very reason. It covers a lot of basics and is designed to be easy and help you feel comfortable with the process. (Yup, there is even a shopping list for the projects.) When you sign up and this course will come straight to your in-box for the next 7 days. We want to help each of you broaden your perception of what is a fermented vegetable and adjust that to your culinary style. We respect your in-box so you won't get a lot of mail from us. We reach out when there is something new and exciting to share. We send announcements for new and share special recipes through MailChimp. Welcome and Thank you! Other ways to stay connected is with the RSS feed, or following us on Facebook, Instagram or Twitter.